When Israeli singer Yoal Sharabi was a teenager studying at Sde Boker high school in the Negev, he was asked to perform a few Sephardic melodies at the 83rd birthday of David Ben-Gurion. It was during that performance that he realized he wanted to sing and perform professionally for the rest of his life. Sharabi, a natural born entertainer captivated an audience here at the Berney Theatre with his wide repertoire of modern Hebrew, classic Yemenite, popular Chassidic and Spanish songs on December 14, sponsored by Chabad Winnipeg. The younger brother of famous Israeli singer Boaz Sharabi, Yoal has a very powerful, tenor singing voice. In addition, he is a terrific guitarist, percussionist and flutist, who wowed the crowd when he played two flutes in perfect harmony. “The first instrument I learned to played when I lived in the Negev was the flute,” said Sharabi, the youngest of ten children. Sharabi taught himself to play all of the instruments himself because his family was too poor to afford music lessons. 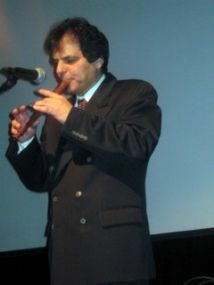 He began his professional career as a flutist in the Be’er Sheva Dance Company, moving to New York in the 1980’s. After playing an exquisite rendition of “Manginat HeHalil” (The Flute Melody), evocative of the deep romantic rhythms of the dessert, the charismatic Sharabi held up two flutes to show the audience. “On the first I will play the melody, and on the second I will play the harmony,” he said, as he played the two simultaneously from different sides of his mouth. As a child in Tel-Aviv, Sharabi grew up singing with and imitating his older siblings at the shabbat table, and his love of Jewish music spread enthusiastically to the audience. 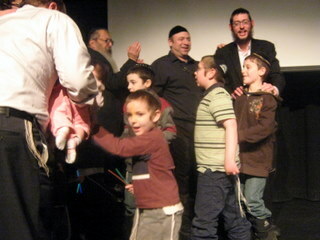 People of all ages clapped and sang along, especially during his rendition of ‘Halleluyah,” “Beshana Haba’ah,” and “Mashiach, Mashiach.” There were even some audience members who danced the horah, during the latter number. Sharabi has performed at some of the most renowned halls including Lincoln Centre, Carnegie Hall, Place Des Arts in Montreal (when he was only 16), and Garden State Plaza in New Jersey. Film director Stephen Speilberg hired Sahrabi to perform at his 1991 wedding to Kate Capshaw. In the latter part of the concert, Sharabi showed off his broad repertoire, by throwing off his jacket, dawning a vest and cap, and belting out songs from Fiddler on the Roof, as he danced around the stage. 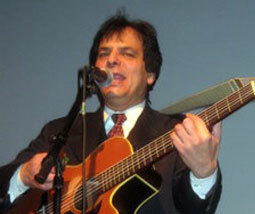 He also performed a Spanish tune, and told the audience about a time when he performing for a non-Jewish Spanish speaking audience in Argentina. Sharabi’s performance here turned out to be on an especially freezing winter night and probably dissuaded some people from attending (the event was far from sold out).